In this looks obsessed world, beauty is not just about having a pretty face. It includes your overall personality, your figure, the way you dress up or the way you carry yourself in public etc. Our society demands all of us, specially the women to be perfect from head to toe, and if you are not, you may have to face the humiliation at times. We live in a society where not just your face but also the color of your elbows and knees matter. One such thing happened with one of my friends where she was ridiculed in public for having dark elbows and knees. In fact, not just my friend, but there are thousand others among us who face such situation and desperately needs help. Are you also a victim of such a situation? Do you feel ashamed of flaunting your hands and legs? Do you also have to cover up your dark elbows and knees by wearing full sleeves tops and full pants? Well, then this post is a must read for you. Here, in this post, I will be sharing an extensive list of 33 natural tips that’ll help you to lighten dark elbows and knees easily. Having dark elbows and knees is very frustrating and has become a common problem nowadays. Although darkening of such parts can happen to anyone regardless of skin color, it is mostly common with people with darker skin tone. This is because they have more melanin content, which makes their dark elbows and knees all the more prominent. Moreover, our elbows and knees are always in motion and are one of the most utilized joints in our body. They undergo maximum friction, which intensifies their dark appearance. Also, the skin around the elbows and knees are thicker than the rest of the body parts and with no oil glands and less blood supply, they easily become rough, dry and dark. But it’s not that difficult to lighten dark elbows and knees, especially when you know how to get it right. Today I am going to share everything worth knowing about how to lighten dark elbows and knees, including factors leading to dark elbows and knees. But before we discuss those tricks and hacks to lighten dark elbows and knees, let me tell you some of the possible causes behind dark elbows and knees. Each problem has some causal factors behind it and knowing them helps to get rid of the problem faster. Similarly, accumulation of dead skin cells, too much friction and pigmentation are said to be the leading causes behind dark elbows and knees, but there are other factors as well. Therefore, let us know all the possible factors that lead to darkening of elbows and knees. It is not always possible to be born with god-gifted perfection, but we can try to cover up our shortcomings manually. With natural ingredients like lemon, honey, milk, you can easily get rid of your dark elbows and knees. These 33 natural ways are not only affordable but also very easy to use. Whenever I think of the natural ways to lighten dark elbows and knees, the first natural ingredient that comes to my mind is lemon. Lemon contains many antioxidants that make it a perfect bleaching and skin-lightening agent. Using lemon will not only remove the dead skin cells that lead to darkening but also foster the reproduction of healthy cells. You need to take a lemon and cut it into two halves and squeeze out the juices from inside. Then scrub the lemon halves on your dark elbows and knees for minimum 15 minutes. After that, moisturize the area with some mild moisturizer, vaseline or petroleum jelly. Remain indoors for few hours and do not go out in the sun. Also, avoid using water as much as possible, post lemon usage. Repeat this process daily until your elbows and knees lighten and become smooth and soft. All these healthy skin friendly ingredients together makes the ideal paste for treating dark elbows and knees. Turmeric is an antiseptic and it helps in removing the dark spots while milk also has skin lightening properties. Honey acts as the perfect moisturizer and naturally hydrates your skin. Hence, all these three together is very effective to lighten your elbows and knees. You need to take turmeric, honey and milk in adequate amounts and mix them to form a smooth paste. Apply on your dark elbows and knees and massage in circular motion. Let it stay for at least 20 minutes and rinse it off with water. Repeat this process weekly in order to lighten your elbows and knees faster. 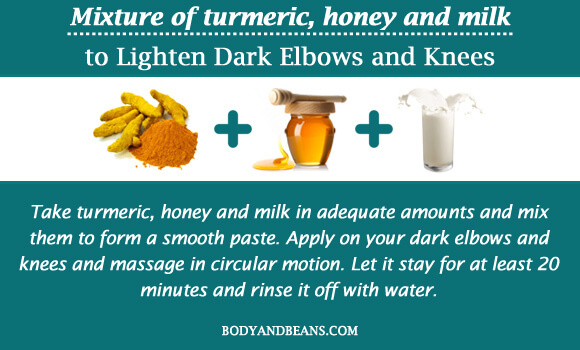 This is one of the efficient natural ways to lighten dark elbows and knees and is used since ages. It is especially good for people with dry skin as the presence of antioxidants in it makes it an excellent skin hydrating and moisturizing agent. The Vitamin E found in it repairs the damaged skin and lightens the skin tone. You can use only coconut oil or add walnut powder to it to enhance the good effect. At first, you need to make a thick paste of coconut oil and walnut powder. Use this as a scrubber on your dark elbows and knees. Leave it for 5 minutes and then wash it off with water. Alternatively, you can put coconut oil on your dark skin areas daily after taking shower as well as before going to bed. Baking soda is a great exfoliating agent that deeply cleans your skin and removes the dead skin cells. On the other hand, the presence of lactic and amino acid in milk softens and nourishes your skin. Milk also contains many antioxidants that keep your skin healthy and glowing. You need to mix baking soda and milk, 1 tablespoon each. Then apply it on your dark elbows and knees and scrub the dark skin in circular motion. Leave it for 5 minutes and then rinse it with water. This remedy is good for pigmentation and you can use it every alternate day to get rid of it. The exfoliating property of sugar is very efficient in removing the dark skin cells, which is very important to get rid of the darkness of your elbows and knees. Olive oil is another moisturizing agent that helps you get smooth rough skin. Therefore, sugar and olive oil when mixed together nourishes and hydrates your skin very effectively. You need to mix 2 tablespoon of sugar with 2 tablespoon of olive oil and stir it properly. Apply it on your dark elbows and knees and massage for around 5 minutes. Then wash it off with water. You can use this method every alternate day to get maximum benefits. We already know how lemon and olive oil are so effective in lightening your dark skin. Therefore, when they are mixed together along with the exfoliating salt, it becomes another ideal natural remedy for treating your dark elbows and knees. You need to take 2 tablespoon of lemon juice and mix it with 1 tablespoon of olive oil and a bit of salt. Rub the mixture on your elbows and knees for around 15 minutes. Repeat this process daily for effective results. However, avoid this remedy if you have any cut or injury on your elbows and knees. Potatoes can be used to get rid of dark elbows and knees. They have bleaching properties that nourish and brighten up the dark dull skin of your elbows and knees. You need to cut thick slices of potato and rub it on your dark elbows and knees for few minutes. Let the juice stay for around 15 minutes and then rinse with water. Daily usage of potato will soften your elbows and knees and lighten the skin tone as well. Aloe gel is extremely beneficial for your skin and is considered one of the best natural ways to lighten elbows and knees. It protects your skin from the harsh effects of the sun and makes your skin soft, smooth and bright. Simply take an aloe leaf and extract the juice out of it. Apply the gel on your dark elbows and knees and let it rest for around 20 minutes. After that, wash it using lukewarm water. In order to get best results, apply aloe gel twice daily on your dark skin. The anti inflammatory and antiseptic property of mint leaves is very good for your skin. It heals your skin and lightens the skin tone by fading all the scars and dark spots. 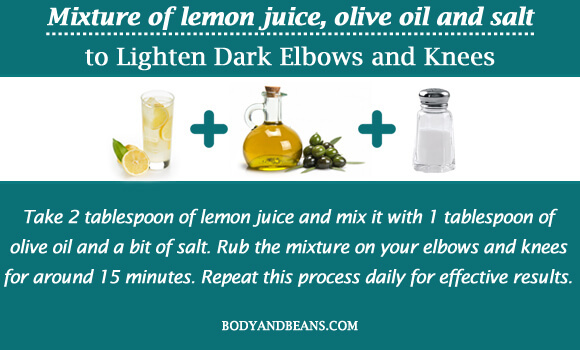 Adding lemon juice to it makes the mixture ideal for lightening your dark elbows and knees. At first, you need to boil the mint leaves in water and then add lemon juice in it. Allow the mixture to cool down. Then apply the mixture on your dark skin with a cotton ball. Leave it for 20 minutes and then rinse with warm water. Daily using this remedy will lighten your dark elbows and knees easily. If you want to have white, buttery soft elbows and knees, you can go for the mixture of cocoa butter and shea butter. Both of them contain natural fats that moisturize and nourish your dark skin besides whitening them. 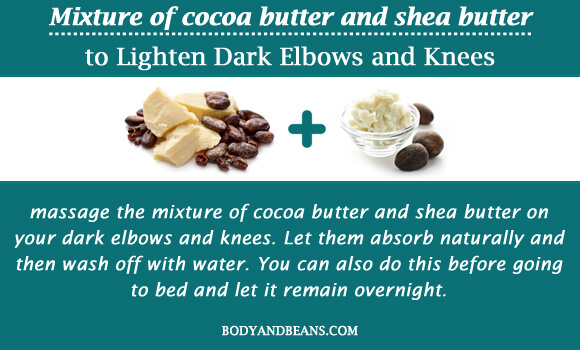 You need to massage the mixture of cocoa butter and shea butter on your dark elbows and knees. Let them absorb naturally and then wash off with water. You can also do this before going to bed and let it remain overnight. Frequent usage of this remedy will make your dark elbows and knees soft, smooth and glowing. 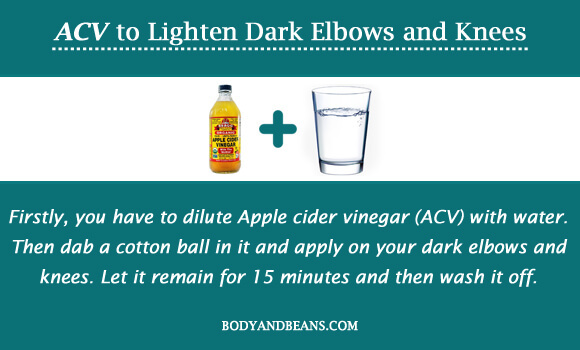 Apple cider vinegar (ACV) usage is another effective way of lightening the dark skin of your elbows and knees. The acidic content in it makes it an efficient bleaching agent that exfoliates and lightens the dark portions. Firstly, you have to dilute ACV with water. Then dab a cotton ball in it and apply on your dark elbows and knees. Let it remain for 15 minutes and then wash it off. In a week, you can use this remedy thrice for satisfactory results. People who suffer from pigmentation issues that resulted in darkening of the skin may use this remedy as Vitamin E can fight the problem of pigmentation. The mixture is very efficient for lightening dark patches. Sugar removes the dead skin cells and vitamin E hydrates your skin and makes your skin light and healthy. You need to take some Vitamin E capsules and pour out the oil from them. Mix some sugar in the oil. 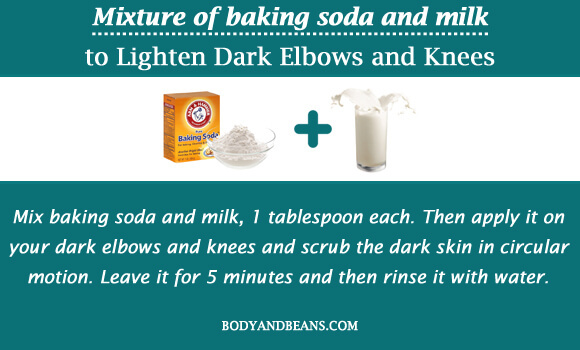 Then use this mixture as a scrub on your dark elbows and knees. After scrubbing for few minutes, rinse it off. This remedy can be used every alternate day for best results. 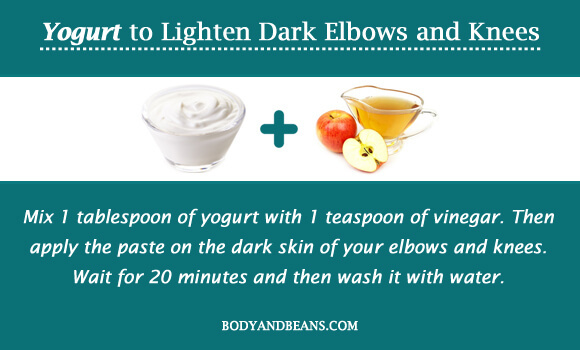 You can use yogurt to get rid of the darkness of your elbows and knees. This is because yogurt nourishes your skin and cleanses all the dirt and impurities out of the pores. It also removes the dead skin cells and hence prevents skin darkening. Addition of vinegar in it enhances the good effects and fights pigmentation issues. Mix 1 tablespoon of yogurt with 1 teaspoon of vinegar. Then apply the paste on the dark skin of your elbows and knees. Wait for 20 minutes and then wash it with water. You can use remedy on regular basis to get fairer elbows and knees. From the name of the ingredients only, you can have a fair idea of how effective this paste is for skin whitening. These ingredients themselves are all very effective and mixing them together makes the paste four times more effective. This paste will make your skin soft, clean and glowing. Make a thick paste with 2 heaps of chickpea powder, 2 teaspoon of milk, 2 teaspoon of turmeric powder and 1 spoon of lemon juice. 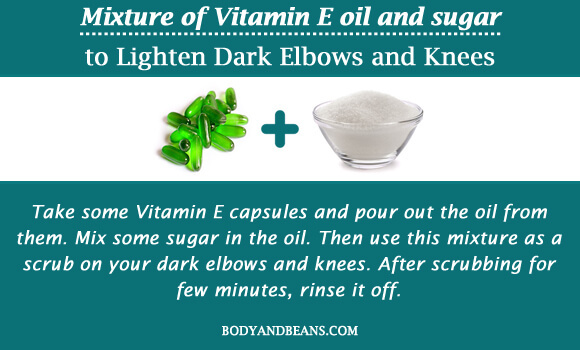 Apply the mixture on your dark elbows and knees. Let it get dry and hard and then wash with mild soap and water. You can use this paste two times on a weekly basis for best results. Papaya can lighten and moisturize skin especially the thick skin on your elbows and knees. It also helps you get rid of the roughness and makes your skin smooth and healthy. You need to cut the papaya into pieces and mash them. Then add a bit of water and apply on your elbows and knees. Let it remain for 10 minutes and then wash it with plain water. Use this remedy thrice weekly and enjoy the smoothness and softness of your elbows and knees. Since ages, gram flour is used in various remedies for skin issues out of which lightening dark elbows and knees is one. It is a natural moisturizer for your skin and is very effective in cleaning the dirt out of the pores. It removes the dead skin cells and gives a healthy glow to your skin. 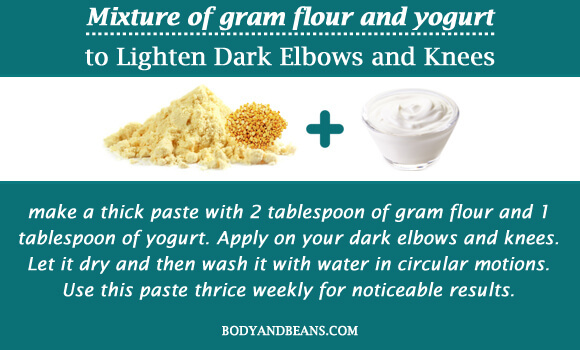 Gram flour when mixed with another skin friendly ingredient like yogurt makes the perfect remedy to lighten the dark elbows and knees. You have to make a thick paste with 2 tablespoon of gram flour and 1 tablespoon of yogurt. Apply on your dark elbows and knees. Let it dry and then wash it with water in circular motions. Use this paste thrice weekly for noticeable results. Buttermilk contains all the ingredients needed to whiten your dark skin. It contains the natural moisturizer milk, the bleaching agents vinegar and lemon and also salt, which is an exfoliating agent. Therefore, all these components together make buttermilk usage one of the best natural ways to lighten dark elbows and knees. Although buttermilk itself is very efficient, adding ground oatmeal and almonds to it will magnify the benefits. It will not only help you get rid of the dark patches but also make it soft and supple. Take all the above ingredients in adequate amounts and make a paste of them. Apply the mixture on your dark skin patches and massage in circular motion. Let it stay for around 10 minutes and then wash off with water. Weekly usage of this remedy will prove to be very beneficial for you. Oil massages have always been very effective for treating skin issues and mustard oil massage is very beneficial to get rid of dark elbows and knees. It contains erucic, linoleic and oleic acids that provide proper nourishment to your skin. 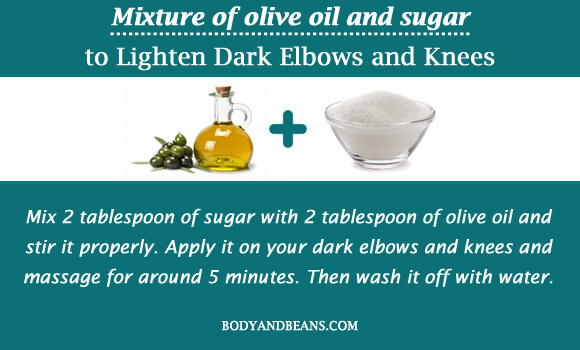 It helps you brighten your dark elbows and knees as well as keep them moisturized. Take a shower and then massage mustard oil on your elbows and knees. Let it remain for few hours until your skin naturally absorbs it. Then wash it with warm water and mild soap. 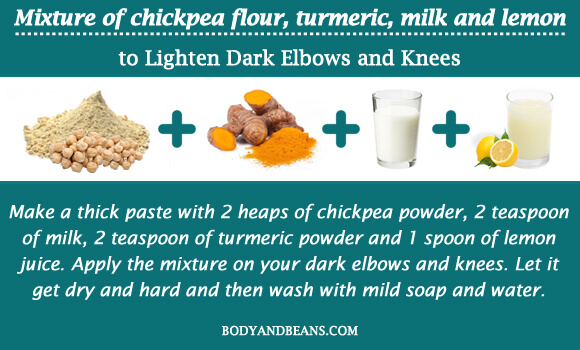 Repeat this remedy on a regular basis to get smooth, bright elbows and knees. Another ingredient that is very helpful for your skin is hydrogen peroxide. It is found in several commercial skin whitening products. It removes the dead skin cells and has mild bleaching properties, which help you lighten the dark skin tone. Take few amount of hydrogen peroxide solution. Then dip a cotton ball in it and apply it on your dark elbows and knees. After 15 minutes, wash your elbows and knees with lukewarm water. Pat the area dry and put some moisturizer over it. With pumice stone, you can easily exfoliate your dark elbows and knees. This will help to lighten the dark skin by removing the dead skin cells that lead to skin darkening. The method of usage is also very simple. You have to take shower in hot water. Scrub your elbows and knees with the pumice stone in circular motion. Then wash with cold water. Twice usage of pumice stone weekly will help you get rid of your dark elbows and knees. Sometimes, besides unavoidable factors, we ourselves do stuffs that unknowingly cause harm to us. You need to be aware of them to get rid of your problem faster. 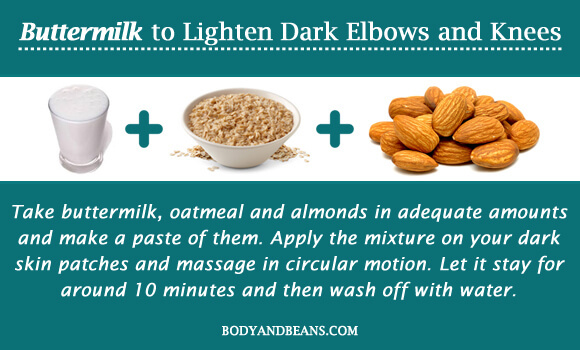 Besides the above-mentioned natural ways to lighten dark elbows and knees, follow all of these below written steps that will help you prevent the darkness of your elbows and knees from occurring. Please use a sunscreen whenever you are going out in the sun. Try to wear full sleeves to cover your elbows and knees during daytime. You must carry an umbrella every time you step out. Avoid leaning with your elbows and knees as much as possible. If that is unavoidable then cover them up with some light clothing. Drink plenty of water to keep your body hydrated and free of toxins. Use an exfoliating brush while taking shower. Go for mild soaps only and avoid the chemical based ones. Never forget to moisturize your elbows and knees after using any soap. Whenever you are scrubbing the skin of your elbows and knees, try not to be too harsh as it may too damage instead. Take some old socks and cut them. Every night apply vaseline on your elbows and knees, put the socks over them and let it stay overnight. Repeat this process for few weeks and enjoy the results. Maintain a balanced diet and include adequate vitamin E enriched foods. If you are too bulky, be determined to shed few kilos. There is no doubt that having dark elbows and knees is seriously frustrating. 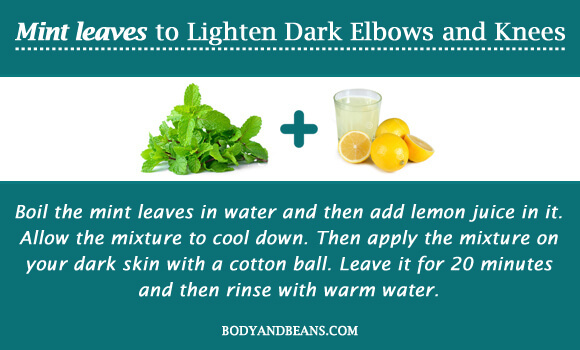 It can be really difficult to get rid of them, unless you know about the remedies that helps lighten dark elbows and knees. 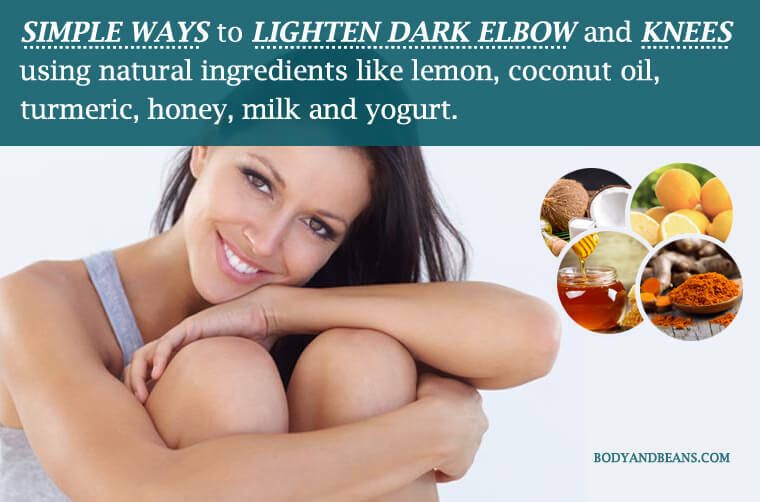 Nevertheless, with natural ingredients like lemon, coconut oil, turmeric, honey, milk and yogurt, you can make remedies that can help you to lighten dark elbows and knees easily and naturally at home. Many girls go for costly pedicures and manicures to get rid of the dark patches but these are costly and everyone can’t afford. For them, the best option is to go for the natural ways to lighten dark elbows and knees. 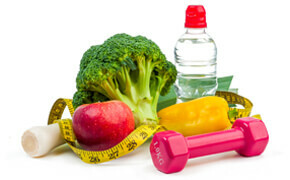 Besides, do maintain a healthy diet, use sunscreens everyday and drink plenty of water. Therefore, with natural remedies together with a healthy and disciplined lifestyle, you can easily get bright soft and smooth elbows and knees which you will certainly love to flaunt. The natural ways to lighten dark elbows and knees are safe but despite that, you must do a patch test of every remedy before using them. This is because each one of us has different skin types. So we must use the right ingredient in the right procedure and get the desired glowing elbows and knees. However, if none of these works, don’t hesitate to consult a doctor and opt for proper medication. Do you have dark elbows and knees? 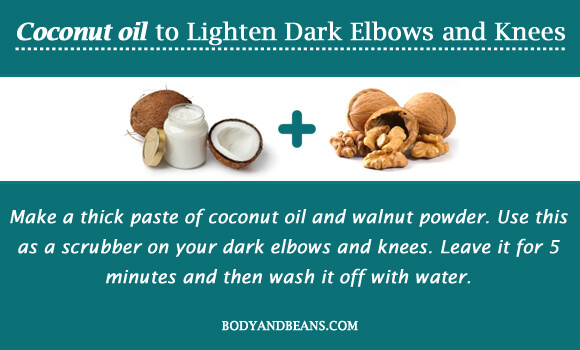 Have you ever used natural ways to lighten dark elbows and knees? Which remedy worked for you the most? Do share me your feedback by leaving a comment below. Also, share any other natural remedy that you feel is beneficial to get rid of dark elbows and knees. Till then stay happy, stay healthy, stay gorgeous.